The powerful, precise, highly-concentrated beam of light initially known as Light Amplification by Stimulated Emission of Radiation (LASER) is so ubiquitous that the acronym has now been relegated to lower case. Lasers are used in everything from weapons to barcode scanners. They have increased efficiency and advanced technology in numerous industries such as communications, manufacturing, and virtually every branch of science. 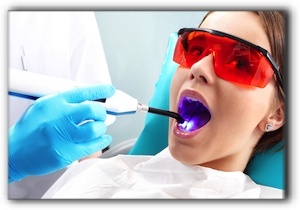 Today’s post focuses on how lasers have impacted dentistry. Lasers are now used in many cutting-edge Nevada dental practices for a broad range of procedures. Lasers allow dentists to be extremely precise when working on both tooth and gum tissue. Steven Do, DDS, employs advanced dental technology with seasoned know-how to serve our valued patients. At Providence Dental, we believe that every man, woman, and child deserves a beautiful smile and a lifetime of oral health. For questions about laser dentistry, family and pediatric dentistry, cosmetic dentistry or dental implants, call 702-852-2244 today to schedule a consultation at Providence Dental in Las Vegas. We are located at 7181 N Hualapai Way Ste 105.